Fully equipped Vacation Townhomes in the middle of everything Orlando. Next door to the Convention Center, just up the road from Disney, SeaWorld and Universal. Sparkling pools make Vista Cay Resort incredible. 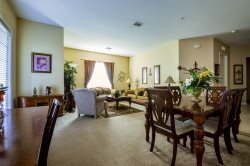 Enjoy this spacious and fully equipped Orlando vacation townhome that is perfect for families and small groups.